We received 2 different Graze boxes today, one is my husbands and one is mine. I already reviewed mine earlier today and you can find the review here. Graze is a company that sends you a little box once a week ( or every 2 or 4 weeks) with 4 different healthy snacks. They have a lot of snacks to choose from, like different whole nuts, dips, popping corn, pure fruit, flapjacks, ..... . So there is definitely something for everybody. You can look through their selection and click if you like it, love it or if you want to 'trash' it. I like that because there are a couple things I dont like, so I just 'trashed' them. It contains Sour Cream and Onion Cashews, Graze's Chocolate Orange, Booster Seeds, Scandinavian Forest Dried Fruits. My husband will take some of his snacks to work tomorrow and he was very surprised when he read through the Nutrition Facts because most of his Snacks are very high in Protein. He is very excited and after trying out my box tonight he already knows these whole nuts, seeds and pure fruits will taste great. I will keep you all updated how we like the healthy snacks in my husbands box. If you all are interested in checking out Graze, here is my link. You will receive your FIRST AND FIFTH box for free and shipping will also be free. So why not go ahead and just try it. If you checked out my blog recently, my husband and I each received an offer for a free Graze box. I will review each box separately. They just arrived today and I am super excited to share my reviews about them with you all. I got cookies and cream, promodoro rustichella, summer berry flapjack and raspberry coconut muffin. I personally am super excited about the summer berry flapjack and the raspberry coconut muffin because I selected the items, when I had the choice to click 'love it'. The promodoro rustichella and cookies and cream were a surprise for me and I am eager to try them out. I just tried the flapjack and it is like a soft chewy cookie, super moist and delicious. Great berry flavor and not too sweet. I also tried the promodoro rustichella just now and even though I love my sweet snacks, that savory snack mix made out of almonds, cheese croutons and little tomato baguettes is great. I really like the tomato flavor and it is not too salty. They included a little snack guide, which I really like because it has the Nutrition Facts on the back. I am very happy about my first Graze box and I cant wait till my husband is home so he can try out his box. So far these snacks are very tasty, healthy and make me want to try out all the other different snack options too. If you all are interested, here is my link. Update: We just tried the raspberry coconut muffin and cookies and cream and my husband and I both love them, my husband prefers the raspberry coconut muffin one, because he loves coconut and it just all goes so well together. Perfect blend of coconut, armaretti drops and raspberry cranberries. I like the cookies and cream more because that's just my perfect treat, plus I love the sunflower seeds and hazelnuts in it because they make it extra crunchy. Our daughter ate all the promodoro rustichella and my husband and I shared the rest. Wow such a great hit in my family! Coupon Code March20 gets you 20% off anything in their shop. This review is about the second box we received this month. It just came in today, so it was way behind shipping schedule. The box I am reviewing today is for a 3 year old girl and is quiet similar to the other one we received last week already. You can find the review about our first box here. But now lets check out the box we received today. a Yum Yum Bakery Hello Book from Hello Hanna. We already tried out the eco-dough® from our first box and it is awesome. It smells great, is very easy to handle and its made with all natural ingredients. We received a blue one and a green one this time. I really like the Beginner Farm Puzzle Set and cant wait to open it (I will save it for my daughters Easter basket). We just now started playing with puzzles and she really seems to enjoy them. The Nail Buddy is perfect, because we have a girly girly in our house. She loves to get her nails painted. It is too funny, because she randomly asks 'Can you paint my nails?' (usually while shes going potty or in the car). I will put the Yum Yum Bakery Hello Book from Hello Hanna in my gift closet for now or maybe use it on a rainy day. It looks very cute and I like the idea, that kids can develop and write their own stories and include special stickers. All in all I like the items we received in our 3 year old box. The value is very good and I am happy to receive items that I usually wouldn't buy. I just hope shipping will be a bit faster next time. I you are interested in checking out Citrus Lane please follow this link. I just found a flyer in my Fitness Magazine for a free Graze Box. My husband and I love healthy snacks and they have such a great selection we had to try it. They have 90 snacks to choose from, so there is something for everybody. They have nuts, fruits, dips, popping corn and so many other things that just look delicious. You can choose if you want to have it delivered weekly, every 2 weeks or every 4 weeks. We just selected what we want in our first free box and cant wait for it to arrive in our mailbox. I will let you all know when we got it. Just head over here and check it out. This month we received our first Bluum Box. I was very excited since the founders are German. Bluum Box is a monthly subscription service for moms and kids. You receive a box each month around the 17th and it will be filled with lots of goodies that match for your childs age. After you receive the box you can review the items on their website and earn points. Your can then redeem the point for free boxes. I think that idea is great especially the option to review the products. We received our Box last week, but I waited with my review since I wasn't quiet happy with what we received and so I contacted customer service. They replied today and apologized. They also offered me a discount for my next subscription and told me I would receive 'a lot more in my next Bluum Box'. So lets see, I am very willing to give them another try, because everybody deserves a second chance. And after all the products weren't bad, I just expected something different. Here is what we received this month. It is a great pampering box for our daughter, I was just a little disappointed because we didn't receive a toy or book like so many others did. Like I said above these are great pampering items, but there is nothing my daughter can actually play with or hold with out my supervision. We tried out the Poppy Drops tattoo earrings and they are great though. Easy to apply, safe and removable. After looking trough the box with me and inspecting all the goodies, my daughter found the packaging material and had a lot of fun playing with it. She calls them her 'fuzzies'. 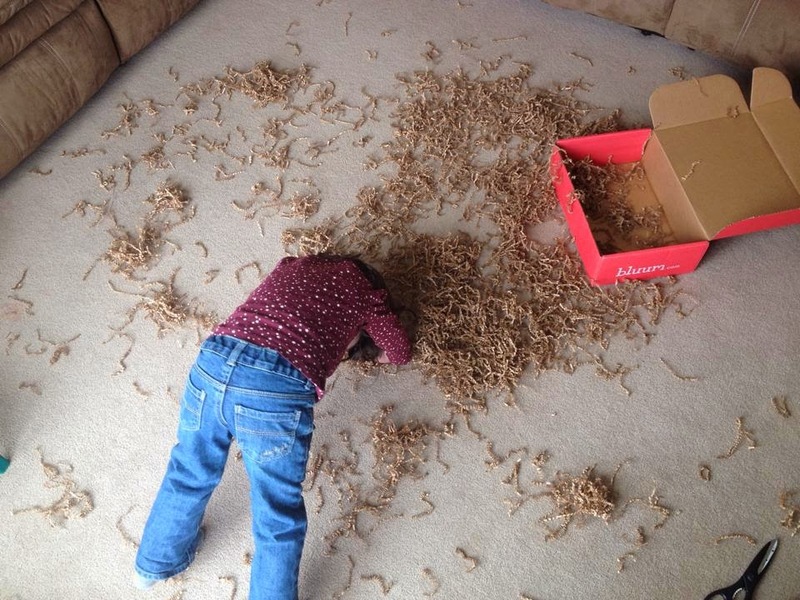 So afterall she wasnt upset that there was no toy or book and spend the next hour making a 'mess'. After all I am very impressed how fast and professional Bluum Customer Service handled my request. And I am very excited to see what next month will bring us. I found a great deal for healthy snacks and treats. Naturebox makes it happen. Every month this snack food box sends out 5 full packages (or depending on what box size you choose you can also get more) of healthy snacks that taste great. These all-natural snacks are nutritionist approved and if you are unhappy you can always get a full refund. Pausing/suspending a subscription is also available. Here are the flavors we chose, Dark Cocoa Almonds, Honey Mesquite Almonds, Baked Sweet Potato Fries, Sunshine Chips and Southern BBQ Sunflower Kernels. We tried all of them and so far our top favorites are the Dark Cocoa Almonds (somebody in my household is addicted to chocolate, so these are great) and the Southern BBQ Sunflower Kernels. But all of them are very good and tasty. Here is a list of all their items. My verdict all together is that their products are great and if you think about how much you would pay at other stores for healthy, good-tasting snacks, you know this is a great deal. Update: We decided not to order a box this month since we received the biggest box they have last month. After everybody in my family snacked on all of them we decided that the Dark Cocoa Almonds, Baked Sweet Potato Fries and Southern BBQ Sunflower Kernels. Here an example how I enjoy the Southern BBQ Sunflower Kernels. I add them as a crunchy topping on my Cheese Omlet. It is very delicious and the Southern BBQ spice adds great flavor..
We subscribed to Citrus Lane last year but just received 2 boxes. After I got a great deal in February, I decided to do it again. We loved the boxes last year, so I was very excited about this months box. Our daughter is 2 years old and she received, 2 tubs of the eco-dough® from eco-kids® (one red and one yellow), a purple Medi Buddy from me4kidz, A Beginner Puzzle Set from Petit Collage and I got a Cirtus Hydrating Body Lotion from Weleda. We already tried out the eco-dough® and it is awesome. It smells great, is very easy to handle and its made with all natural ingredients. We also opened up the Medi Buddy and my daughters doll 'Luise' got a bandage and a sticker for being a good girl at the doctors. I am very excited about the Body Lotion I got because Weleda is a huge brand where I am from (Germany) and I never had the chance to try them out. I already smelled it and it smells very fresh. All in all, I really like the box we received and I am pleased with the contents. My daughter on the other side could care less about all the goodies, she just loved the 'fuzzies' (packaging). And “MARCH20” gets you 20% off anything in their shop. Here is the link to the Citrus Lane website.